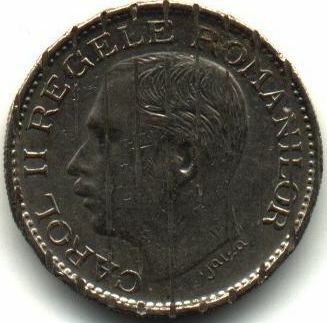 denomination "100 lei", year 1936 and Romanian coat of arms, at left laurel twig, at right oak twig; outer pearl circle the inscription "CAROL II REGELE ROMANILOR" meaning "KING OF THE ROMANIANS" and CAROL II head facing left; outer pearl circle. Under the neck lies I. Jalea, the engraver's name. 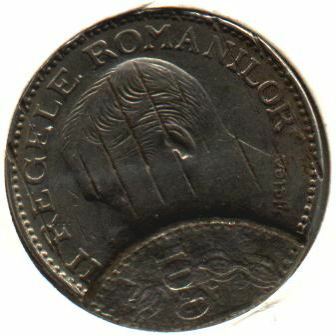 According to the information from the book Monetele României (Iliescu and Radovici, 2004), some 100 lei coins with year 1936 were struck in 1937 too. From the same book: only 16.750.000 coins with year 1936 were struck during the two years of striking. 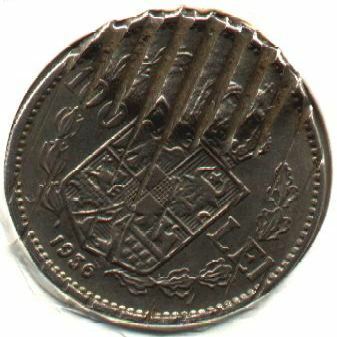 The edge of the coin is adorned with two wavy lines, separated by a rhombus. The small axis of the two rhombi is horizontal. 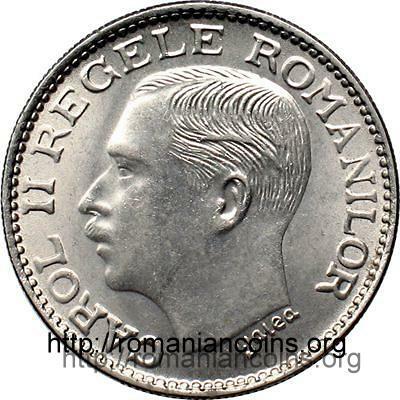 The pictures of 100 lei 1936 coin above are present on Romanian coins through the kind permission of an anonymous donor. The nickel coins of 100 lei minted in 1936 and 1938 (20.230.446 respectively 3.250.000 pieces) and those of 50 lei of 1937 and 1938 (shown on the previous page, 12.000.000 respectively 8.000.000 pieces) were drawn out of circulation once WW2 started. The coins struck during the war were made of zinc (2, 5 and 20 lei) or nickel plated iron (100 lei), solutions cheaper than nickel itself and also less necessary to the armament industry. The pieces pulled out were demonetized, that is stamped inside a pattern that impressed both on the obverse and reverse paralel lines and concentric circles (varying from case to case). This step forewent destruction and was meant to hinder fraudulent reintroduction of the coins back again on the market by the operators that were assigned to retrieve the precious metal. Below there is such a marked coin (for melting) that somehow escaped destruction. The demonetized coins were sent for melting to the German company Vereinigte Deutsche Metallwerke AG (VDM) at Altena, a city from North Rhine - Westphalia. The plant of Altena was specialized in nickel metallurgy, and here were made the nickel-plated iron planchets on which the 100 lei 1943 and 1944 were struck. The recovered nickel was partially used for plating the mentioned iron planchets, the rest having been used by the German industry. All the demonetized coins pictures above were provided to Romanian coins by Mr Moise Alexandru-Răzvan. 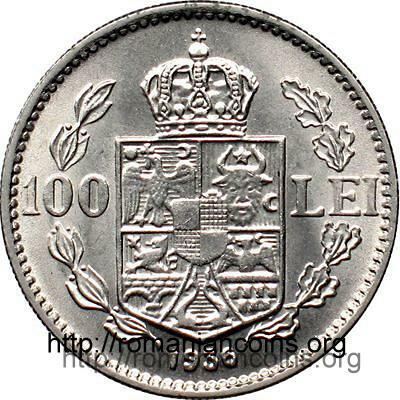 The 50 and 100 lei coins issued in 1936, 1937 and 1938 are the first (and, since today, the only) Romanian coins made from nickel. 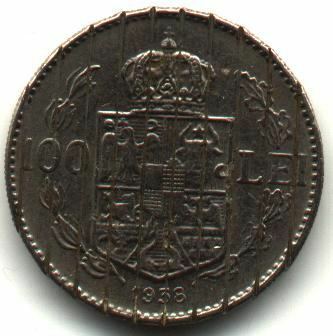 The Romanian coinage used the nickel for the first time at the cupronickel coins of 1900 (5, 10 and 20 bani 1900). 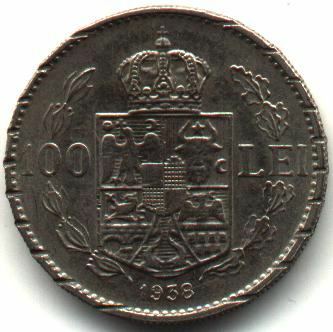 The first modern nickel coin is a Swiss 20 centimes from 1881. Even some antique nickel coins exist, struck in the 2nd century B.C. in Bactria, a territory located in the nowadays Afghanistan, conquered by Alexander the Great and afterwards turned into a Hellenistic kingdom. It is not known for sure where did the nickel used by the Bactrians for coinage come from. Nickel is a silvery-white metal, ferromagnetic, and very resistant to corrosion and oxidation. The US 5 cent piece, named "nickel", is made from a copper and nickel alloy that is not ferromagnetic. So, despite its name, no pure nickel! The copper-nickel alloys with less nickel are not ferromagnetic because their Curie points (the temperature at which the magnetic properties change, by heating, from ferromagnetic to paramagnetic) are below the common temperatures of the surrounding medium. Or something alike... Nowadays the best known nickel coins are the ones struck by Canada, e.g. 10 and 25 cents issued after 1978. Below you can see a counterfeit coin (made of lead? 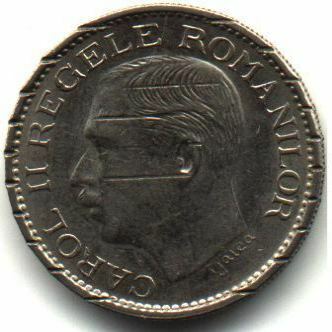 ), present on Romanian coins through the kind permission of Mr. Áron Kovács. A good share of the fakes introduced on the market in the period between the two World Wars and during the Second World War were manufactured inside the very Romanian State Mint, with the very original dies. Several common metals and alloys were used. Most often encountered are the bronze and lead fakes.